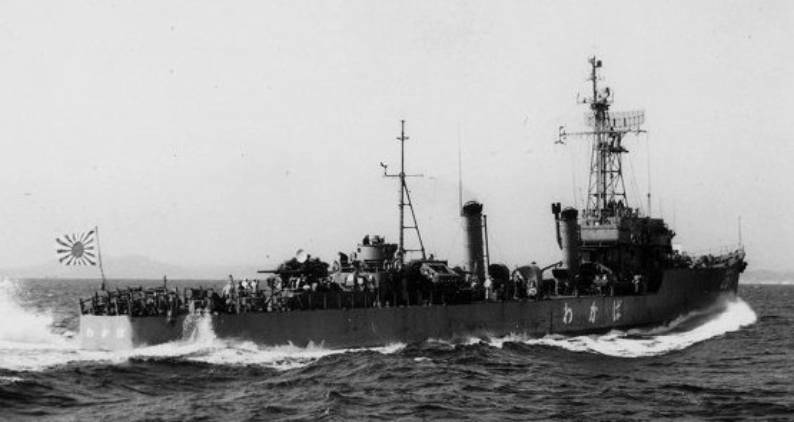 JDS Wakaba (DE 261) was the former IJN Nashi, a Tachibana-class destroyer. The Nashi was sunk in July 1945, but salvaged in 1954 as the Wakaba, later being refitted as a radar trials ship. As such she was the only ship of the Imperial Japanese Navy to become part of the post-war Japan Maritime Self-Defense Force, and for some time was the biggest ship in the JMSDF. Nashi was completed at Kobe, and under Lieutenant Commander Takada Toshio was assigned to Desron 11, Combined Fleet, for training on 15 March 1945. In May 1945 she was assigned to Destoryer Division 52, Cruiser-Destroyer Squadron 31. Nashi escaped an attack on Kure harbour by B-29's on 22 June 1945, but on 28 July 1945 was sunk at Mitajirizaki, Kure (34°14′N 132°30′E﻿ / ﻿34.233°N 132.5°E﻿) by aircraft from Halsey's Task Force 38. Takada and most of the crew escaped alive. On 15 September 1945 Nashi was officially struck from the Navy list. The ship was refloated on 31 September 1954 and then repaired at Kure before being recommissioned in the JMSDF as the Wakaba on 31 May 1956. She was refitted in 1958 for use as a radar trials ship, and sonar was added in 1960. Wakaba was struck on 31 March 1971, and scrapped in 1972-73.